Well greetings friends! This is Herbert W. Armstrong with the good news of the world tomorrow. Yes over beyond impending catastrophic world happenings and destructions that will dwarf all past wars and troubles is coming the glory, the divine splendor of the Kingdom of God. But listen — why doesn't God take every new convert immediately to his reward as soon as he is converted? Why must the Christian go on suffering after he is converted? Most people believe that when a person professes Christ he is right then and there saved. Well if so, why doesn't God remove him instantly then and there from the unhappy trials, misfortunes, the sufferings of this life? Why doesn't God take him immediately out of these troubles into that eternal state of happiness and bliss? Actually if a person is really converted, his troubles then and there seem only to begin. He encounters problems and troubles that he never had before. Your Bible says "Many are the afflictions of the righteous" (Psalm 34:19). "All who will live godly in Christ Jesus shall suffer persecution" (II Timothy 3:12). And again "It is through much tribulation that we must enter the Kingdom of God" (Acts 14:22). Well why? Jesus said that the attractive, the broad, the easy way that is so popular leads to destruction. But that the way that leads to the happy bliss of eternal life is the straight and narrow, the hard and the difficult. "Woe unto you [said Jesus] when all men shall speak well of you" (Luke 6:26). "If they have persecuted me [He said] they will persecute you [also]" ( John 15:20). My friends why should this be? There is only one answer. According to the commonly accepted beliefs about Christianity and salvation it just simply doesn't make sense. The answer is almost no one today knows the real purpose of salvation. Almost no one today understands what salvation is. The common idea is that God finished His creation way back there when He first created Adam and Eve. And that then God just went off somewhere and is now occupied elsewhere with some other interest. That God left it for man to establish his own civilization and his own way of life. That God is concerned only with one thing in our lives today and that is to repair the damage caused by the fall in the Garden of Eden. To restore us to a condition as good as Adam and Eve were before the fall and that salvation is the process by which we are saved, as they say, from the result of that fall and assured of going to heaven when we die. Well of course from then on everything will be endless happiness and bliss. But I have never heard anyone who believes this popular idea explain why those who accept Christ and are saved, as they say, have to wait until they die to escape all the sorrows and the sufferings and the problems and the temptations of this life. Why are they not whisked immediately off to their reward? Of course, then again, I've always noticed that no one seems very anxious to die and to go to that reward. Now a lot of these things my friends simply do not add up. And if we are not afraid to take these conceptions out and to look at them, I think it is about time that we come to understand. Yes something is wrong. I think it is about time we got straightened out on what life is all about, what salvation really is, why it is, what its purpose is, and how we get it. Very few know the answers. And I assure you that it does all add up, it does make sense when you come to understand. Now what is God's purpose? Why did He put humanity here on the earth? 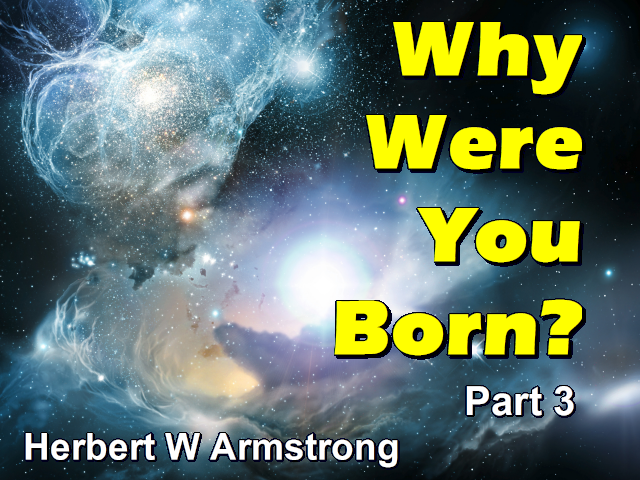 Why were you born? There's a purpose for your life that you probably do not know and if we will open our minds and our hearts and let God reveal the great and the tremendous purpose, we will be shocked with amazement. For God's purpose so far transcends anything that most people have ever conceived. What God has in store for you, the very purpose of your existence is so tremendous that it is going to take some time for your mind even to grasp it. God is reproducing Himself believe it or not. It is going to take a long time before the truth of that great statement can sink into your consciousness; before your mind can even grasp it. But my friends it's in your Bible right there in the very first chapter of Genesis It's in your Bible all the way through the New Testament, it's in your Bible all through the writings of the apostle Paul. It's all the way through the New Testament teaching in your Bible — that God is reproducing Himself and that God is creating in us something that was not finished. The creation was not finished back there in the original creation that you read of in the first chapter of Genesis. He wasn't even through creating there because He created something else even on that day. He created it by resting. All that He ended was His work which He made. Yes, He ended His work. But, what God had created there was merely the physical counterpart, the physical prototype out of which God has since gone on creating ; it was merely the clay model so to speak, out of which God began to fashion and form and shape as the master potter forms and shapes the ultimate image that finally is to be. A living nephesh — just as the animals had been made living nephesh. Only man was made after the image of God and the other animals were not. Now the first Adam was made a living soul and the word 'soul' comes from the original Hebrew word 'nephesh' which means 'the life of animals.' It means mortal life, animal life; "the soul that sinneth it shall die." (Ezekiel 18:4, 20). Jesus said fear the man that can destroy the soul in gehenna fire. (Matthew 10:28) It is something that can be destroyed — it's something that can be burned up. Now the last Adam which was Jesus Christ was made a quickening spirit. He was spirit, but the first man was not spirit. Jesus said that which is born of the flesh is flesh (John 3:6) — that's what we are. But He said we can be born again (John 3:7). God is a spirit you read in the fourth chapter of John's gospel (John 4:24). God is a spirit, but man is flesh. Everywhere your Bible says that man is flesh. Man is the clay model. God is spirit, but Jesus said to Nicodemus that man can be born again. He can be born of God and that which is born of the flesh as we have been born the first time IS flesh; that's what we are. But He said that after we are born of the spirit, that which is born of the spirit IS SPIRIT; no longer mortal flesh. Now notice what we read here in I Corinthians 15. This first man was a living nephesh or animal life, but the last Adam, Jesus Christ, was not of animal life or made of matter. He was a quickening, that is an energizing, immortal, life-giving spirit. "Howbeit that was not first which is spiritual..." (I Corinthians 15:46) Well then Adam that was first was not spiritual; it says so right here. There it is in verse 46; look in your own Bible — open your Bible, won't you run and get it real quickly, look into it with your own eyes. Yes you have to be begotten of God and then born of God. Now "The first man is of the earth, earthy:" (I Corinthians 15:47) He comes out of the earth. "... dust thou art and unto dust shalt thou return (Genesis 3:19), said God to Adam and we are born of Adam. Now here is the verse, listen. God said let us make man in our image and people have always thought that He made us out of a spiritual image. My friends, image has to do with form and shape. Image does not have to do with composition. For instance in the Rotunda, the state capital in Richmond Virginia just comes back to me, I've seen it; there is a statue of George Washington and it was posed for by George Washington himself. The living man in living flesh stood there while this man modeled or while this man sculptured that statute and it looks like George Washington. Now it is an image of George Washington — it is in his image, but it is only composed of either stone or marble. It is not composed of flesh and blood. Now the man whose image it is stood beside it while the sculptor was chiseling it out and making it, but he was not formed of the same thing. He wasn't made of stone. No, he was made of flesh and blood. He was made of something corruptible. He died and he was buried and he has rotted and decayed, my friends. And he is dead. But as in Adam all died, so in Christ shall all be made alive and even George Washington is coming back to life in one of the resurrections. There is more than one resurrection mentioned in your Bible too, if you understand it. Through Christ, who is of the spirit and composed of spirit and is now very God — born as a son of God by a resurrection from the dead. And He is the first born of many brethren and you can be born as a son of God because Christ has pioneered the way. He is the pioneer of our salvation. Oh my friends if we can only conceive of it. And I think, let's see it is in Isaiah is it not? Where God is the master potter and we are the clay? (Isaiah 64:8) Oh how wonderful. Now God did not complete creation back there my friends; creation is still going on. What God completed was the physical phase of creation. He completed the physical earth, He completed the physical animals, He completed the creation of the physical man made of the dust of the ground. But creation is now going on and your New Testament says so. That we are a new creation in Christ, if we are in Christ. If we are in Christ, we are a new creation. And we are being created in true righteousness and holiness in Christ Jesus. That's in your New Testament. Yes my friends, God is reproducing Himself. Let me tell you something, God set material physical reproduction in human life as exactly the type of the spiritual reproduction. Now all life comes from an egg and that egg must be impregnated by the energizing, the life giving nucleus or sperm cell that comes from the father. And that little sperm cell that is so small that you could never see it with the naked eye carries in it and embodies within it the nature and even the personal characteristics and often even the color of hair and the complexion and often many of the little personal ways and characteristics of that father. And the little egg from which every human being has sprung is about the size of a pin point at the beginning. And there is a little ovum out of which every one of us have come and that ovum of itself had no life within itself and it has a life time, as leading scientists and physicians believe today, of not more than twenty-four hours. Not more than twenty-four hours of life and if it is not fertilized in that time, if it does not have life imparted to it by that time, it dies. There was no real life there any how. It just had a temporary existence of twenty-four hours. Now then, my friends every last one of us is an egg and we have a life time of the proverbial three score and ten. Whatever it is, whether it's seventy, eighty, ninety years, we have an existence of that long. And we have no immortal or eternal life; absolutely none. But we have the possibility of it in a way that no animal has, because there is something in a human being that is that nucleus that has that potential life-giving property that does not of itself have an eternal life — that does not of itself have inherent life in itself as most people have foolishly come to believe from the philosophies of the pagan philosophers — that's where it came from it did not come as a revelation from God. It is not in your Bible and that isn't where they got it. They believe that there is something that they call an immortal soul. Well God formed man of the dust of the ground. Now man died the same as animals died and he had the same breath that animals had. There it is — same thing exactly. But my friends, there is something in man that no animal has and that is mind. Animals have brain, but the animal brain is something that works automatically as God set it to work as instinct. Under certain conditions the animal's eye sees a certain thing. It operates on the animal brain to cause that animal to do a certain thing that God has already set in advance. And animals act according to instinct. Animals don't have to be trained and taught, they don't have to be educated, they don't have to; they don't have minds to go to school and be educated and learn before they know what to do. A little human baby is the most helpless thing in the world. He is born without any knowledge, but he is born with a mind that has potential abilities of acquiring knowledge. He can be taught, he can be educated, he can accumulate and absorb knowledge. He can think, he can reason, he can plan, he can design, he has original initiative, he has ideas and thinking capacities, and he can reason out and think out ideas, and create ideas and arrange plans and design things. And then he has will to carry out his purposes and his designs and to build and to make things in a way that no animal can do. I have mentioned so many times on this program before; birds build nests. A robin builds a robin's nest and a wren builds a wren's nest — there's some difference. An eagle builds an eagle's nest — quite a little different. But every robin builds the same kind of a nest that other robins have built for thousands of years. A robin can't change it and turn it into a square shape instead of a round shape. A robin can't make it a whole series of labyrinth of rooms and different designs and use his own ideas and initiative and creative powers to think out some different kind of a nest, he cannot do it. He has to do it just as God designed it and set it in his little bit of a bird brain there to do. Now that is the way it is in animal life. But my friends God is a creator and God is supreme mind and God is the kind of divine supreme mind that thinks and plans and originates and creates and then brings into existence what He has thought and designed. Now He has given man some of those God-powers. We are limited; we can't bring into existence out of nothing as God can, but we can design ideas and we can create in the sense of changing existing materials into the form, the shape, the pattern, the thing that man has designed. Oh, think of the possibilities of a man. Now, whatever it is in the human mind and in one or two places in your Bible it is called spirit. Whatever it is there is something in the human mind and it is a mind similar to that of God only so limited by comparison. God is not limited in any manner, shape or form, but man is. Thank God we are limited, look what we are doing with our minds. Look at the bombs, the hydrogen bombs and the guided missiles and the things that we are now originating and inventing with the human mind to DESTROY. Now God is a creator. God is a builder. When Jesus was here on earth, He was God changed into the human flesh. He was mortal, so He could die, of course, but He was God that had been converted into, changed into mortal human flesh. So He was human flesh, but He did the things of God. He had the mind of God. He had the right mind and what was He? He was a carpenter — He built, He created. He wasn't a home wrecker. He didn't go around wrecking homes and He didn't fall in love with some other man's wife or anything of that kind either. He didn't wreck homes one way or the other. Not at all, He just loved all people. He had a divine love for all people and set an example for us and oh, if we only had. But my friends look, now see if we can understand it. Time is fleeting — I want to explain this before this broadcast is over. I wanted to say a lot of other things I'm not going to get as far as I wanted, but I want to finish this and go on, on the next program of showing you why it is that you are not taken immediately to your reward and why God allows troubles and sufferings and problems and even persecutions and things like that to come onto Christians. There is a reason — oh what a wonderful reason when we come to see it. I'll tell you it really adds up. It really makes sense when you come to see it. But now, when the Spirit of God, my friends, is allowed to enter into a man and it can only come when the mind has repented of its own way. When the mind has come to see that God's way and God's laws are right and has repented of ever having rebelled against God's way — has repented of going the way that has seemed foolishly as the right way to the man. Now when a man comes to that place where he is really overcome with remorse and with real repentance down deep; until he really comes to abhor himself and is really broken up about it and he is thoroughly disgusted with himself and he sees how glorious how great how perfect how right is God and he wants to be like God and he wants to really yield and surrender himself to God. Well here he is, he's all separated from God — his sins have caused a separation between him and God, but Christ is the missing link. There is a missing link between us and God. It is missing in most lives; thank God not in all lives. That link between man and God that is missing in so many cases is Jesus Christ. There is no missing link between man and the dumb brute; absolutely none. The scientist in their deluded reasoning's are still searching for it. They have never found it, they never will, it doesn't exist. They can't find what isn't there. But there is a connection — man was endowed with a possibility of being begotten and then born of God. God said 'let us make man in our image.' Now here is the way it works. When a man really repents, then there is Jesus Christ that can link him to God. And when he really believes with faith in Christ; Christ my friends took all of his sins and paid the penalty and then that penalty is wiped out when he accepts it. It doesn't stand between him and God anymore. He is reconciled to God. The connection is made. The way is opened up between him and God and God sends the Holy Spirit. Now the Holy Spirit has a hard time entering a human being. Just like the scientists tell us that the sperm cell has in entering the ovum before we are born in the first place. But once the Holy Spirit enters — now where does it enter? Well it really isn't in your stomach; it isn't in your hand, or your foot. The Holy Spirit enters your mind and it enlightens your mind. And the Holy Spirit is the spirit of a sound mind. And the Holy Spirit coming into you brings about the renewing of your mind. And there is the nature of God transplanted into you. There is the spiritual nature, the spiritual mind, the spiritual character of God now transplanted into your mind. And it combines with your mind and the two meeting together, my friends, form a new life, a new spirit begotten life. Now that life, just like the life that has been formed that is to be a human life; the life that is to become a human life, as I say starts out no bigger than a pin point. And it must grow in its mother's womb and it must be fed on physical food, because it is going to be a physical human baby. It must be fed and nourished and it must grow to a certain size before it can be born. Now likewise my friends we receive so little of the spirit of God to begin with and spiritually we are just as insignificant and little as a pin point. But if we grow in knowledge and in grace, if we overcome and root out these things of the human flesh and the human ways and the passions and everything — oh I tell you my friends we shall be born of God. Now there is growing, there is overcoming and that my friends, I haven't had time to go into the details, but I'll explain it in the next broadcast if God is willing. That is why God allows persecutions, trials, problems, troubles to come — to develop us that we may grow like God. And we become a new creation and God is creating us in true righteousness and holiness as a child of His. God is a family. We can be born into that family. God help you to understand.